Anyway, it was in an interview format with Shatner and an interviewer sitting in chairs on the stage. Shatner basically went through his whole life with extremely funny anecdotes (he’s quite the comedian), some occasional clips from TV appearances, and a few emotional stories such as choosing his father’s coffin and finding his wife dead in their swimming pool! Of course he finished off with a “song” about hockey which was classic. Afterwards some of us got to meet him and get a photo. I only wish my dad were alive so I could tell him that I met Shatner, he would certainly have been impressed being a big Star Trek fan. – He has never watched any of the other Star Treks apart from his series! – He has worked extremely hard as an actor throughout his life and believes in saying YES to opportunities. Something that I agree with wholeheartedly. Anyway, it was great fun. It lasted about 3 hours with an intermission, so there’s plenty of material. Highly recommended if you are a fan. See if you can see him on the other tour dates. 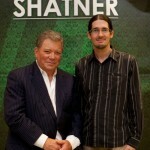 Posted in Musings | Comments Off on I met William Shatner! You are currently browsing the Grey Alien Games weblog archives	for October, 2011.